Are you mindful when you eat? When clients come to see me for weight loss, I ask them ‘How fast do you eat?’. Most of them tell me that they eat quickly, often with the TV on. I explain the importance of eating slowly and without distractions so that you can hear the messages that your body sends you when it has had sufficient to eat. Last week I had an extraordinary experience. I persuaded a friend to experience mindful eating with me. I cut up some salad vegetables and feta cheese in bite sized portions and put them into two containers. My friend agreed to put on a blindfold and then I gave him his food. I did the same. We agreed not to talk while we were eating. It was hard not to talk but it became very meditative. When we had finished we were both very calm and peaceful. We had both really tasted and enjoyed the food. The texture and sound of the food also became more apparent. I stopped eating before the container was empty because I knew I had eaten enough. No distractions – turn off the TV, put away the mobile phone or Tablet. This is a good start to losing unwanted weight. The term placebo has often had negative connotations in the past. It is almost as if something that helps the body heal itself naturally is somehow cheating or suspect. The word placebo comes from the Latin for ‘I shall please’. Most of us have experienced the placebo effect while taking traditional medicine. If you have ever bought a branded medicine instead of a generic alternative, some part of your mind was convinced by the packaging or the extra cost that the branded medicine would work better. If you believed it enough, it probably did work better. That is the placebo effect and we all experience it. In recent years there has been lots of research into the placebo effect in the area of pharmaceuticals. It has shown that the size, colour, shape and the name of medications has an effect on their efficacy. Even the smell has an effect. Researchers found that if they wiped TCP antiseptic around the top of a bottle of tablets, the tablets were more effective! The attitude of medical practitioners also has an impact on their patients. The more the practitioner builds trust and rapport with their patient, the more the patient is likely to respond positively to treatment. So, in my opinion, we should be much more open to understanding and using the placebo effect to aid our natural healing processes. Want to Lose Weight? Change Your Mind! If you have resolved to lose weight this year, the chances are that you have been looking at diet books and weight loss clubs and wondering what will keep you motivated and whether you can keep weight off in the long term. So many people lose weight on a diet only to put on more when they start to eat ‘normally’ again. In a new book published this month*, Dr Deborah Cohen sets out two forces that are driving obesity in the modern world. One is the availability of cheap food, large portion sizes and food advertising. The second major force is our human nature, the fundamental limits to our self-control and the unconscious ways that we are hard-wired to eat. Dr Cohen says, “Because our moods and desires change throughout the day, many people claim their weight problem is the result of emotional eating. They say they eat when they are stressed, lonely or anxious – whenever they are not at their best. Yet others claim they eat too much when they are happy’. When I work with clients who want to lose weight we talk about establishing a different relationship to food. I always start by asking them to eat slowly so that they really notice what they are eating and can recognise the signal that their body has had sufficient and is satisfied. I also help them to discover techniques for recognising emotional hunger and dealing with it. If you really want to lose weight in the long term you need to change your mind first. It is the only way to long-lasting change. The weeks around Christmas an New Year can be among the most difficult times for relationships. That’s why solicitors make special discount offers for divorce advice at this time of year. There are lots of reasons why your relationship could come under pressure. It could be seasonal depression, the financial pressures of Christmas, or an excess of alcohol at parties. Some people decide that they want to make a new start in the New Year and that includes their relationships. If you are in an abusive relationship then you need to take action. But if your relationship is just at a low ebb, stop, think again and consider taking some relationship advice or therapy. How many people regret leaving a relationship which just needed a bit of time and effort? Set some time aside to spend alone with your partner with no other pressures. Do something you both enjoy. Hug your partner every day even if you are busy. A hug releases the hormone oxytocin into your blood that bonds you with your partner. Exercise together to boost your health and well-being. Going for a walk together around lunch time will get you back in touch with nature and expose you to mid-day sunlight. Have a laugh and a smile with your partner to release the positive hormones that make us feel good. Most importantly, keep talking and listening to each other. Don’t just wait for your turn to speak, really listen to what your partner is saying. Christmas can be a time for creating wonderful new memories that you can share and look back on in future years. Have a great time. There is a book cafe in my village once a month. It is a chance to buy second hand books for just 50p so I have bought many fiction and non-fiction books that I would never have tried. They also sell great home-made cakes but that’s another story! That’s an elegant way of saying that its not what happens to us that is important, its the sense we make of it. Lets take the example of two drivers who nearly have an accident. The first driver congratulates himself on using his knowledge, experience and skill to avoid the accident. He drives away with no ill-effects. The second drivers worries about what might have happened if the accident had occurred. He goes over and over it in his mind thinking he was just lucky that it didn’t happen and his luck might run out soon. He drives home but the next day he can’t get back in the car. The difference between the two drivers is in the story that they told themselves. This is the way that phobias can start and they can often generalise from something small or something that didn’t quite happen and start to move into other areas of you life. The good news for the second driver is that after 20 years of not driving, he came to see me. After a few sessions of hypnotherapy and NLP he is now confidently back on the road. A story with a happy ending! 1st October is the start of the NHS month long campaign to encourage people to give up smoking. I have worked with a number of clients who wanted to stop smoking but I don’t take on every smoker who asks for my help. First I want to know first how motivated they are to quit. If they are already feeling some of the health effects of smoking, such as breathing problems, high blood pressure or strokes then I know that they are ready to commit. Finances are another great motivator and, for women, the effects on their appearance can be very powerful. So, if you are thinking about stopping smoking, start by reviewing your reasons and measure how strong that motivation is on a scale of 0 to 10. The clearer you are about your reasons the more likely you are to succeed. Once you have decided, tell a friend or someone you trust that you are going to stop. Ask them to check how you are doing on a regular basis. Making your decision public is another indicator of success. The sun is shining but the summer is nearly over and next week the children will be going back to school. We all know what happens next – the cold season starts and I don’t mean winter! As soon as the children start mixing at school the germs start spreading. The primary way to catch a cold is through someone sneezing on you. From the time that someone sneezes on you or near you it takes only 15 minutes for the cold germ to travel to the back of your nose and start infecting you. The average cold lasts between seven and ten days. Unless you spend your days in solitary confinement, there is not much you can do to prevent yourself catching a cold. There are many viruses that give rise to cold symptoms and no effective immunisation has been developed yet. You can boost your immune system by taking Vitamin C and zinc. You could also try using a saline solution to keep your nose moist and clear of germs. One mind/body techniques that I use is to imagine a transparent shield around me that stops germs from getting through. It also stops other people’s negative attitudes infecting me! Have a happy and healthy Autumn. When I am coaching clients I often encourage them to have a to-do list. This not only helps to give structure to your actions, you also get a burst of the hormone dopamine as you tick things off your list and move towards your goal. This contributes to your feelings of happiness. 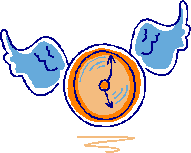 To help with time management I also suggest having a to-don’t list for the things that steal your time and stop your progress. These things can arise in a couple of ways. Firstly there are the things that you enjoy doing but they are a waste of time if you do them for significant periods. How much time do you spend playing computer games or looking at social media? If it’s too much, put it on your to-don’t list. Secondly, there are the things you do when you don’t want to do something you need to. I remember when I had essays to write for my OU degree, I would suddenly find cleaning the bathroom or unblocking the drains very attractive occupations! If you have jobs that don’t need doing, put them on your to-don’t list and concentrate on the activities that will take you towards your goal. It is important to recognise when you are procrastinating and think about why you are putting off those important tasks. Is there a fear attached to the task or is just a job that you don’t love doing? What action could you take to overcome that fear or outsource the job? So what can you put on your to-don’t list today? Are you looking for reliable and friendly menopause advice? Do you remember when you were a young teenager? Puberty was like a badge of honour and you talked endlessly with your friends about period pains and what was going on with your body. And then later when you were pregnant you talked with all your women friends about all the intimate details of your pregnancy. So what happened when you started to approach menopause? Was it still ok to talk to your friends about this new stage? Or was it suddenly a bit embarrassing? It was certainly my experience that it was much more difficult to talk to women friends about anything to do with menopause. Maybe that’s because it is seen as a sign of ageing and is viewed in a negative way despite all the positive aspects. That’s why I decided to write a book that would be like having a knowledgeable friend. Someone who can help you discover useful information plus tips on nutrition, exercise and lifestyle. Even better, someone who can give you easy to follow mind/body techniques that will help you to get back in control of your symptoms. 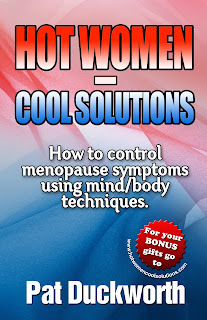 ‘Hot Women, Cool Solutions™: How to control menopause symptoms using mind/body techniques’ can be your new best friend and it will cost you less than having lunch with one of your women friends! How can I stay cool and sleep better? How do I control my weight? How do I keep my ‘mojo’? 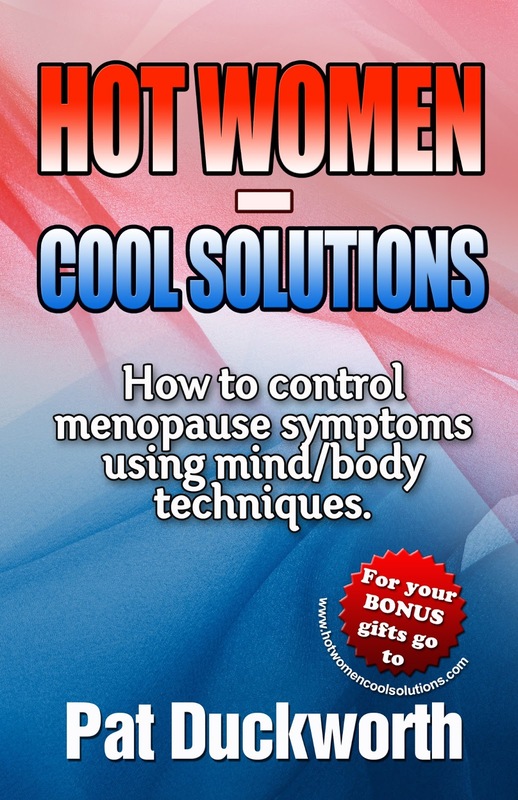 The book comes with access to bonus gifts including The Menopause Workbook, The Stay Cool Hypnotic Recording and the Mindful Weight Loss Hypnotic Recording. Researchers at Cardiff University have determined that Monday 21st January 2013 is Blue Monday – the most depressing day of the year! I have really noticed since the Christmas holidays were over how subdued people have been in the supermarket and around the town. But stop worrying now because this year 21 January is also National Hug Day! I know what you’re thinking, ‘There’s colds and bugs around, why do I want to hug someone?’ Well firstly, having a positive attitude is very good for your immune system. Secondly, making social connections is essential for boosting your mental health. And finally giving and receiving hugs causes our body to release the ‘feel good’ hormone oxytocin. Oxytocin has been credited with numerous body-and-mind benefits, including: giving us healthier hearts; improving our relationships with other people; slowing down the ageing process, and (critically) making us feel happier. If you’re not ready for that hug yet, you can achieve similar results from giving and receiving smiles and you can do that from a safe distance!